Thanks to Frank, the seventh annual Wurtsboro Mountain 30k replaced my long training run today. Unofficially, I finished in 3:07:07. Officially, this race turned out to be much, much more then I expected, both in difficulty and in scenery. The only regret I have is that I decided NOT to run with my camera just moments before the start, and thus missed out on some amazing pictures of waterfalls, mountains, rivers and streams. For the quick down and dirty.....My friend Kristen and I drove from White Plains to Wurtsboro (about an hour and 15 minute trek) early this morning. At preregistration we met up with Frank, Emmy and Tom Triumph. Tom is an amazing dude, and is a Badwater finisher. Frank and Emmy are super speedsters (I believe Emmy finished 3rd female overall), so at the start of the race they were off and running. 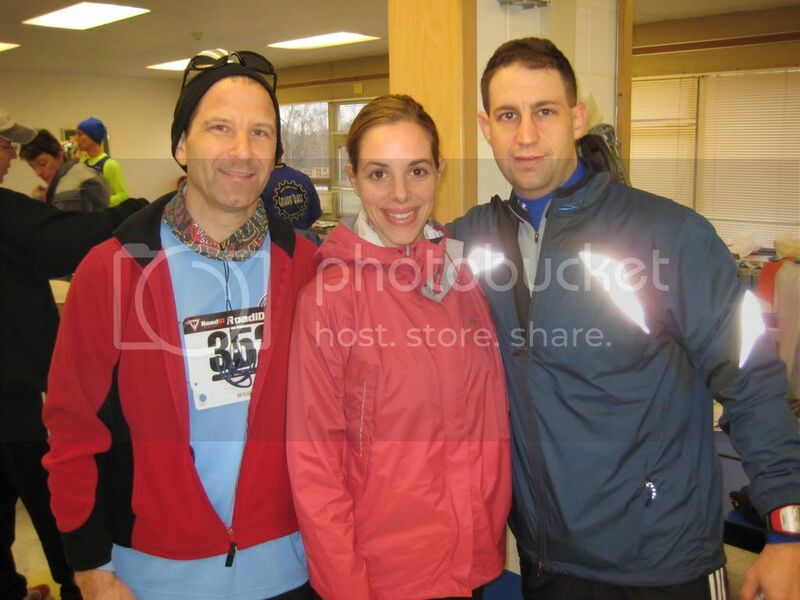 Me, Tom and Kristen went at our own pace and pretty much decided to have a blast together. The first 3.5 miles was a sick uphill battle. We were smart and power walked most of it, saving some gas in our tanks. when we finished the initial hill climbing, the Garmin had our overall pace somewhere in the middle 12:00s. Then came rolling hills, and we picked up the pace quite a bit. Tom appointed Kristen to be our leader for the last 3 miles of the race, and set a goal of a 9:30 pace. Well, Kristen is tough, and she ran us through the last 3 miles at about an 8:30 pace. I am quite amazed at how we performed after the first 3.5 miles...well enough to get our overall pace down to about 10:00/mi. I have to say that this was one of the best training run / races that I've run in a while, solely due to the company along the way, and also because of the scenery. It was absolutely beautiful out there. I've discovered a part of New York that I had no idea existed. We are actually thinking of returning next week for a long run (and I will not leave the camera in the car). This event was fantastic...a definite must do if you live near the New York area. Tomorrow I'm replacing another training run with a race (thanks, again, to Frank), when I head to the Taconic Road Runners Club 24th annual St. Patrick's Day 10k. There is a chance that Emmy and I will head over to Bear Mountain after this event to try to hike part of the North Face Endurance Challenge 50-Mile course....we'll see. especially the map! i'm so glad you decided to jump into this race! will have rr and some pictures up tonight. see you tomorrow at fdr! HOLY!! It still amazes me that you ultra peeps are like "Yeah I'll just throw in a 30k this weekend" like it's no big thing LOL That's pretty sweet though. It sure as heck beats a long run by yourself. Frank - thanks a ton for letting me know about this one (and tomorrow's). See you there. Thanks Marcy. Totally beats a long run alone. Anthony --did we really run up that mountain?? Thank goodness I saw your course profile after the event. I slogged through 10 miles this afternoon (2 hours -walked some)and I am beat --my quads are trashed from the hills (I felt pretty good today-only 3 days of running this week), so I pushed the pace)but it was 6 hours on my feet, like meridith recommended! --so glad that your found the 30K --it is truly a beautiful course, especially mile 14 by the lake (when one is feeling the pain)--too bad you didn't bring your camera!! Congrats to you and Kirsten and Tom -see you tommorrow (don't look to me to be racing but I will take some photos). Emmy - Awesome to see you and Frank today. That was such an amazing course. Congrats on another great finish, my friend! And good luck tomorrow as well!! sounds like a lovely experience I look forward to the photos next time. hope the 10k went well too! Wow, that elevation chart is a little scary. But it does sound like the ideal "training run." Bear Mt. is where I trained a great deal of time when I lived in NJ...great spot..